After swinging between gains and losses, US crude closed rather flat around $102.40 as energy investors kept their nerve following the ECB stimulus measures. For US oil market participants, it was more important to wait for the Nonfarm Payrolls report before committing further. This may explain why Brent crude moved higher, but WTI was on standby. The stimulus announced by the ECB aimed at addressing deflation in the Eurozone was a breath of fresh air for gold investors, who pushed the metal $9 higher to $1,253.2. It's too early to say that Draghi's package constitutes a game changer for the precious metal, but it was certainly well received amid an ongoing rally in equities. Despite a bigger than estimated drop in weekly crude inventories, as indicated by the US Department of Energy, overall supplies remained near record high levels. 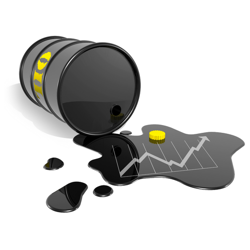 This was seen as a sign of declining oil demand, which in turn pushed US crude prices $0.39 lower to $102.40 per barrel. The thought of sending stock markets to new all-time highs seems to have captured spread betting account holders' entire focus at the moment, so gold is finding itself being completely ignored. This appeared to be the case again yesterday as the precious metal tried unsuccessfully to move above the psychologically important $1,250 mark, only to finish $1.2 lower at $1,243.6. A report indicating a larger than expected rise for US factory orders kept demand for crude oil well supported yesterday. And with supplies at Cushing decreasing as the southern leg of the Keystone pipeline started pushing oil to Gulf Coast refineries, WTI enjoyed a bit of a rebound, adding $0.39 to $102.83. After moving lower for seven consecutive sessions, the gold market managed to eke out a gain on the back of a marginal drop in equities and some profit taking. However, the anaemic rise of just $0.9 to $1,243.9 could be better described as a dead cat bounce; testimony to just how out of favour the precious metal is at the moment. Crude oil prices started the week on the offensive, only to reverse course later on, heading south and closing the day $0.44 lower at $102.46 per barrel. This came amid reports that an oil exports terminal in Libya is about to be reopened. On top of that, China's manufacturing data came in lower than anticipated which might keep oil demand under pressure. As equities rallied, the demand for gold deteriorated further, pushing the metal even lower to $1,243.3, a $7 loss for the day. This particular choice of alternative investment is not very popular at the moment as the stock markets keep reaching record highs. In addition, concerns over inflation seem to have been forgotten which is certainly not helping. Amid plentiful oil supplies in the US, WTI crude prices resumed their slump following disappointing economic data. It was a decline of $0.62 to $102.87, helped in part by reports in the media that Russia has pulled back its troops from the border with Ukraine which took the risk premium off the table. True to its southward trajectory, gold posted another loss of $5.1 to $1,250.6 as a renewed rally in equities captured most of the attention in the spread betting markets. The easing tensions in Ukraine also reduced demand for the precious metal as a safe haven and we're looking at the early February low for the next support around the $1,240 mark.